Often times when one makes a long drive for a climbing trip the excitement that builds is never met by a commensurate level of success upon reaching the crag. Inevitably the project you were psyched about is harder than you hoped, you’re tired from the drive or some other excuse is holding you back. Not so for Boulder, CO’s Jonathan Siegrist. Fresh off a near 19 hour drive, Siegrist rolled in to Kentucky’s Red River Gorge and promptly dispatched with one of the Red’s hardest routes, Lucifer (5.14c), in a mere 5 tries over 2 days. This was Lucifer’s 2nd ascent in the past week after Brad Weaver also sent this Purgatory testpiece late last week. 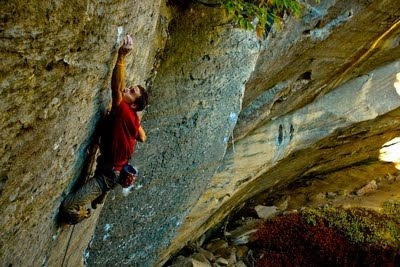 If you are so inclined you can see footage of Chris Sharma sending the route here. Apparently still not all that tired*, Siegrist also flashed God’s Own Stone (“soft” 5.14a) and onsighted Golden Boy (5.13b) and Black Gold (5.13c) with a 2nd try send of Dave Hume’s True Love (5.13d) thrown in for good measure. All within a few days of his arrival. Solid work! Check out Siegrist’s blog for more words and some nice pictures of his efforts. In related news, Magnus Midtbø onsighted Omaha Beach (5.14a) according to his website. In semi-related news, I will be down in the Red for a long weekend beginning next Thursday prepping for my trip to Hueco getting pumped senseless on 5.10 jug hauls that lack any discernible crux. harder climbs = interesting moves. What, too weak to enjoy the “movement*, aesthetics and difficulty” of lucifer? Maybe this will put to rest a question I got about soft grades at the BRC where Jonathan is head routesetter! Yeah JStar has really been crushing recently. I have enjoyed the endless tales of hard onsights and quick redpoints on his blog. I want more 5.14 Onsights, maybe we need to send this guy to Europe!